The picture shows that this soldier has been thru Survival School and learned his lessons well. He's giving the sign of "coercion" with his left hand. These hand signs are taught in survival school to be used by POW's as a method of posing messages back to our intelligence services who may view the photo or video. This guy was obviously being coerced into shaking hands with Hillary Clinton. 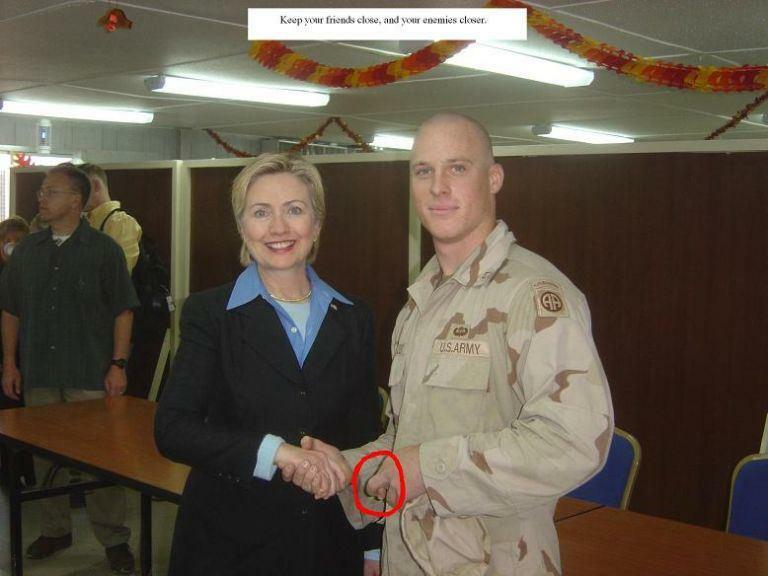 It's ironic how little she knew that he would so inform us about the photo---perhaps because she's never understood our military to begin with. This guys got balls the size of grapefruits!! That is outstanding!! thanks for the laugh. I was in the Air Force and this is priceless to a guy like me! Isn't this a great one!!! My Air Force brother sent this to me. I still have it. Yeah I was a Crew Chief on a refueler KC 135 Q.
I was stationed at Beale AFB. Japan, Okinawa, Phillipines, London, Scottland, England, Hawaii, Guam, Alaska, and all over the States.. I was in from 85 to 89. Had a blast and made great friends and served my country with pride. My son is going in On December 5th!! Save that puppy for the 2008 Presidential Election! Hillary has a grin a mile wide. If she only knew this photo op was going to be a negative one. This was awesome, thanks for the education. No joke, I knew a friend once who guarded President Clinton in the presidential guard. He has a picture of himself shaking the president's hand, and he told me that his (my friend's) grip was so tight that Clinton gave him quite the dirty look. He's practicing what he learned in School. That's funny. What do they say, "A picture is worth a thousand words."